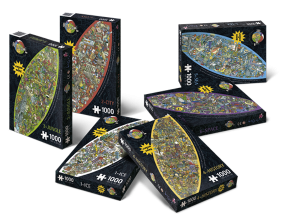 ‘Ahrbol Jigsaw’ is a set of 6 jigsaws each of them depicting one of the 6 themed worlds of Ahrbol. The Ahrbol jigsaws are quite unique in that sense that they come in a unique ‘cigar shaped’ format. Furthermore upon completion the jigsaw becomes a playfield and turns into a game. The stunning artwork is of the hand of the acclaimed ‘Het Geel Punt’ studios and is the same artwork as used in Ahrbol 3D. Ahrbol is a ® brand of Lagali.